https://3ccontactservices.com/why-do-you-need-an-outbound-call-center-for-your-business/ Why Do You Need an Outbound Call Center for Your Business? Steven 3CContact Services 2015-11-03T07:00:33Z 2016-08-18 21:58:37 Blog Array Why Do You Need an Outbound Call Center for Your Business? Many people have an outdated view of call centers. They believe that call centers primarily respond to complaints and answer phone calls and e-mails. While these services are a large part of a call center’s responsibility, outbound services are now a common service provided by call centers and should be an integral part of most businesses looking to grow. With the amount of competition for businesses today, outbound services have become more essential than ever to achieving success. Answering calls, e-mails, or online forms are all examples of inbound services. With inbound services, customers are calling your company. With outbound services, instead of answering calls, your customer service representatives are actually making calls to customers or potential clients. While inbound services are passive and often focus on dealing with issues, outbound services deal directly with growing your business and building your customer base. How Can Outbound Services Help Grow Business? 1.Gain new customers: Many call centers can now act as part of your sales team. For example, call center representatives can both close deals and generate leads for your business. With a call center, sales can be integrated with customer service for a more effective and efficient operation. Call centers have trained sales professionals that can be used on your business’s schedule or flexible arrangements, making them a more affordable and versatile option than an in-house sales team. 2.Increase profit per customer: One of the best ways to grow your business is through your existing customers. Through cross-selling, additional sales can be made through your customer base. Using metrics and customer data, agents can target customers with the products, services, and add-ons that they are most likely to want. 3.Retain customers: Just as important as obtaining new customers is retaining your current customers or bringing former customers back to your business. There are a number of outbound services that can retain and strengthen your customer base. Targeted “winback” campaigns can draw former customers into your current client base, whereas welcoming and follow-up campaigns can ensure that your customers’ are being engaged and that you are building customer loyalty. 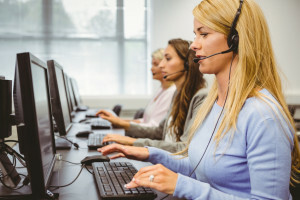 Call centers can deliver outbound services more effectively and efficiently than otherwise possible, as they use automated dialing instead of manually dialing phones. By automating the dialing process, non-productive time can be essentially eliminated and a much greater volume of calls can be placed each day. Predictive automated dialing can boost efficiency by over 250%. By using a call center with automated dialing, you can ensure that you have the fastest service available. With today’s competitive market, being able to get in touch with potential customers before the competition is more essential than ever.